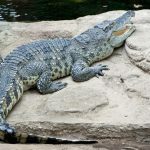 Crocodiles or true crocodiles are a subfamily of large semiaquatic reptiles belonging in the order Crocodilia along with its relatives the alligators and caimans. 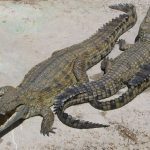 These carnivorous animals are dangerous to humans with hundreds of crocodile attacks occuring every year. 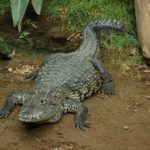 The large and aggressive species like the Nile and saltwater crocodiles are particularly deadly. They can live in both freshwater and saltwater habitats and are found in lakes, rivers, as well as mangrove swamps and brackish waters. Still, most species are known to prefer freshwaters. Crocodiles often spend time on land, basking or looking for food. Different species are found in the continents of Asia, Africa, Australia, and North and South America. All species are carnivores with their diet including anything from fish to small and large reptiles, amphibians, and mammals. 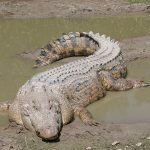 They may also eat smaller crocodiles if available. Being opportunistic feeders, the may hunt for food or feed on carcass if available. The long slender body of a crocodile, along with its flexible tail allows it to swim swiftly in water, while the four short yet strong limbs allow it to move reasonably fast on land. 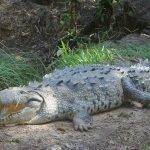 Some species like the freshwater crocodile and Cuban crocodiles can even gallop when moving on land, though they are typically known to do this when running from predators rather than when chasing prey. The larger species have been recorded to be able to move at speeds of over 30km/hour on land. Crocodiles have strong eyesight and excellent night vision, enabling them to hunt at night too. Another characteristic behavior is how they keep themselves submerged in water, keeping only their eyes and snouts over the surface. This makes them efficient as ambush predators as they remain motionless like this so a potential prey would come near enough for them to catch. The fact that they can hold their breath underwater for extended periods of around 2 hours helps with this kind of hunting behavior. 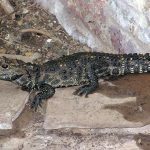 Like most other crocodilian species, mating generally takes place underwater, after which the female makes a nest hole to lay 10-95 eggs with the number varying between species. Females protect the eggs for the entire incubation period of 2-3 months. Once the eggs hatch, both the male and female take care of their young. Their average lifespan extends between 35 and 75 years in wild, with records showing the largest species having the longest life expectancies. 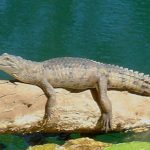 Freshwater, saltwater, and Nile crocodiles have been known to live over 100 years in captivity. 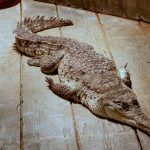 Lolong, a saltwater crocodile captured in the Philippines, was the largest crocodile ever to be caught and measured. It was over 20 feet long, weighing over 2,300 lbs. 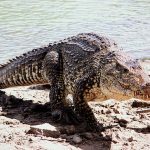 Studies show crocodiles having some well-developed cognitive abilities where they used twigs and tree branches as baits to hunt birds looking for nesting materials. As the birds come to collect the twigs resting on the snouts of the waiting crocodile, the latter would hunt them. 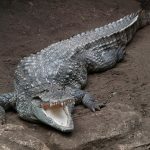 Crocodiles have a total of 80 teeth, each of which the can replace individually about 50 times in their entire lifespan.